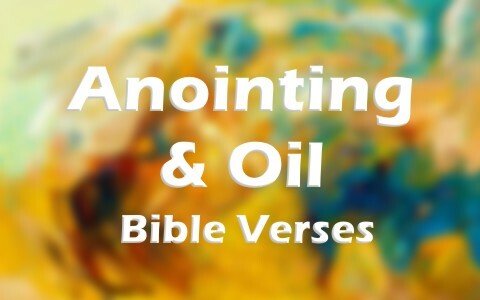 Here are my top ten Bible verses about anointing with oil. Oil has long represented God’s special calling for ordaining someone or something to be used for the purpose of God’s glory. In the context of this chapter, we can read that Moses is closely following God’s requirements for the priestly duties and this is God Himself giving these instructions to Moses (Ex 30:22). The oil, by itself is not holy. It only becomes holy when it is created to God’s exact requirements, and then God declares it holy, like He does those who have trusted in Christ (2nd Cor 5:21). The context of this powerful verse is where the Apostle John is telling the church that God’s Holy Spirit, which is His anointing on us, will teach us what is true and what is not. Perhaps this is why God warned Moses that “It shall not be poured on the body of an ordinary person, and you shall make no other like it in composition. It is holy, and it shall be holy to you” (Ex 30:32), so this anointing is only for those whom God has called and saved, and all who are brought to repentance and faith in Christ. Jesus is quoting the 61st chapter of Isaiah the Prophet where he wrote about Christ where He fulfills part of this prophecy. After reading Isaiah 61:1, which is what Luke 4:18 says, Jesus “rolled up the scroll and gave it back to the attendant and sat down. And the eyes of all in the synagogue were fixed on him. And he began to say to them, “Today this Scripture has been fulfilled in your hearing” (Luke 4:20-21). This must have been a stunning event, because everyone in the temple marveled at Him (Luke 4:22). Why would there be a command to anoint the tabernacle? It’s because the tabernacle represented God’s presence here on earth. Any place where God makes it holy ground, as in the case where Moses was asked to remove his shoes because He was standing on holy ground (Ex 3:5). It’ wasn’t that the dirt or sand was holy; it was God’s presence that made it holy. Without God’s presence, it’s just dirt and sand, but when God is present, its “holy ground.” A similar experience happened with Joshua (Joshua 5:15). This explains why God told Moses that after Aaron and his sons were sanctified (cleansed, made holy) that “Whatever touches them will become holy” (Ex 30:29). This isn’t the only place in the Bible where we are to be praying for one another, but this is one of the few that requires us to ask for prayer and to be anointed with oil. Apparently, this was done by the elders or church leaders, but of course, your church family should already be praying for you, but this is what God prescribed for the first century church. The idea that there were prayer clothes may have come from Acts 19:11-12 where it was said of Paul that, “God was doing extraordinary miracles by the hands of Paul, so that even handkerchiefs or aprons that had touched his skin were carried away to the sick, and their diseases left them and the evil spirits came out of them,” but it seems a stretch that prayer clothes can still be used today, because the context of Acts 19 is where “God was doing extraordinary miracles by the hands of Paul” and Paul is no longer here. This is a praise psalm that we find in 1st Chronicles chapter 16 where David is reminding the nation of Israel that “When you were few in number, of little account, and sojourners in it, wandering from nation to nation, from one kingdom to another people, he allowed no one to oppress them; he rebuked kings on their account” (1st Chron 16:19-21), and God didn’t allow anyone “to oppress them,” on their account, because God saw them as His “anointed ones,” and today, He considers those who have trusted in Christ His beloved anointed ones…anointed by God and His Spirit. James wrote about anointing those who were sick, and in Mark chapter 6, we see the context of this is Jesus sending out the twelve apostles to proclaim the gospel, cast out demons, and anoint those who are sick so that they might be healed. It wasn’t the oil that healed these people, but the authority given by Jesus to the apostles to heal in His name, but wanted the anointing to be associated with it because it represents God’s authority. The Book of Hebrews was written to Christians with a Jewish heritage. I don’t necessarily want to call them Jewish Christians because that might confuse someone by thinking, “How can they be Christians and Jewish at the same time?’ The point in this chapter is about the supremacy of Christ over all creation, including Gods’ holy angels. God has anointed or ordained Christ to preach the gospel of repentance and faith (Mark 1:15), and to set the captives free (Luke 4:18). Who is the Apostle John writing too? Obviously, it was the church. He was writing to the church in the context of there being many false teachers out there and John didn’t want them to be deceived (1st John 2:26), so he says that our anointing by the Holy One, or God Himself by His Spirit, gives us all the knowledge that we will need to keep from being deceived. The more you’re in the Word of God, the more you’ll be able to discern truth from error, even when truth is mixed with error (as it often is). Why was the priest right ear lobe, the right thumb, and the big toe on his right foot being anointed with oil? Perhaps this was God’s way of ordaining them or consecrating them by being anointed with oil, but it also may have signified that the priests were expected to live holy lives that would clearly hear God’s voice (oil on right ear lobe), to perform their priestly duties perfectly (oil on right thumb), and to walk in holiness in their lives (oil on right big toe). After Moses was commanded to “take the anointing oil and pour it on his head and anoint him” (Exodus 29:7), with “him” being Aaron, “the rest of the oil that is in the priest’s hand he shall put on the head of him who is to be cleansed. Then the priest shall make atonement for him before the Lord” (Lev 14:18). Oil in Scripture indicates God’s ordaining or commissioning someone for His purposes (Ex 29:7, 40:9; Luke 4:18), or for His consecrating someone or something, and in some cases, healing, but when Jesus entered the Garden of Gethsemane, He was hard pressed from all sides. His disciples were about to betray Him, His own people were about to falsely convict Him, the Romans were about to unjustly crucify Him, and He would be separated from God for a time, however, God was also going to raise Him (and He did), and all those who have trusted in Christ, because they too have an anointing from God. Something else to read about healing: Are Faith Healers Real? I recall little of when I was saved. I was only 8 or so. So I don’t know if God really rebirthed me into his family, or anointed me with the spirit. But know I believed fully in Jesus. I didn’t expect angels to come down from heaven and start singing, (And they didn’t), but I remember feeling nothing at the time. Is God’s spirit silent, and unfelt when it enters? Maybe it was just the fact I was young, and comparatively innocent, and so I didn’t feel a major difference in my way of life. I have sinned more since than the day I was saved, and by default since I was so young. I really fell short of deserving any grace in the last few months. But I do know that I trust in the Lord Jesus Christ, so do I really need to question if I was saved then? Maybe some confessions later I was saved. Do I really have to know when, where and how I was saved? Or did God do his good work somewhere along this long road? And one more question, I hate to pester, sorry. I think that’s how it goes. So If I believe in Christ, I have the spirit maybe without noticing it’s voice? I just needed some directions. I am going off to bootcamp for Army/Nat. Guard soon, joining my two brothers in the service. And I know if I have Jesus, I don’t need to be afraid. But I just need to know I have Jesus guiding me. Thanks – From a avid reader of this website and your other articles. You are really doing good for people like me, when I need help. It sounds to me that you were raised as a Roman Catholic. Am I correct? I was also. (Being raised in a church where saying and believing the “right” things were enough to keep you “right” with God and out of trouble.) That was my history and others out there I am sure can identify whether Catholic or not. So regardless of your church history here is something that might help you. Sorry for the length but I really feel this is important. Believing and saying the right things is not salvation. Asking Jesus into your heart is not salvation. I know that sounds antithetical to many but it is simply not salvation. Jesus does not “have a wonderful plan for your life” as we were taught when working for Campus Crusade for Christ”(God Bless the memory of Bill Bright, a great man of God). God originally had a wonderful plan but the plan went awry when Adam sinned and all mankind became cursed by God…not just kicked out of Eden, but cursed and damned to everlasting hell with real flames and real worms tormenting your flesh forever, along with Satan and his angels. Not a great picture. Horrible. We have all sinned and are no better than Adam who started this whole process, and therefore we are all damned to hell forever…you, me and everyone. We must understand our terrible predicament. God commanded us that we not lie, steal, lust, or blaspheme His Name just to list four of God’s ten commandments. When we stand before Him after our deaths there will be no excusing these sins. We will all be judged and sentenced to this horrible eternal existence in hell. This should make us weep! We are all damned! No amount of prayer, fasting, reading the Bible, going to church or doing good deeds will rescue us from God’s judgement for our wrongdoing…our sins…. which defied and angered a Holy God, our Creator. This is why we feel like something is not quite right. God, our Creator, made us with a conscience and wrote this Law(His Ten Commandments) on our hearts. We know we have sinned. We know internally that things are not right with our maker. And so we ask questions like yours about not knowing if we are saved. We ask those questions many times of unsaved people who really do not have the answer. They tell us maybe to go to church or read the Bible or pray or do good works, or even ask Jesus into our hearts… but while all of those things are OK, our conscience still tells us we are not right with God. And our conscience is correct…we are not right with God nor will we ever be right with God by doing all of these “good” works. God calls us, as it sounds like He is calling you, to recognize your terrible plight. Not only recognize your position(of being damned to flames forever) but to “OWN” it. Own it down to the very fiber of your soul. You are lost…forever. Darkness, loneliness, separation, despair and torment forever. This should drive us to our knees, crying out for God’s mercy. He is merciful besides being just. You cannot get off the hook though. You must pay for your sins. The dilemma is that nothing you have to offer will satisfy God. You are bankrupt and bereft of anything of value that will appease God’s wrath against your sinful disobedience. How do we know we are saved? “I have written this to you who believe in the name of the Son of God, so that you may KNOW you have eternal life.”(1 Jn 5:13) Read His Word to assure yourself that you are saved once you have asked God to have Jesus be your bondsman and have turned from your sin. “The Spirit itself beareth witness with our spirit, that we are the children of God”(Rom 8:16) God’s Holy Spirit will take up residence inside you. Your body will become God’s temple and you will know that you are saved. This is at the heart of worship when you yield your spirit to God’s Holy Spirit and have communion with your God. “And by this we know that we have come to know Him, if we keep His commandments”(Jn 2:3-6) Striving to remain pure is another witness that God’s Holy Spirit is working within you as you continue to follow Christ. We will fall, but getting up, confessing our sin to God and continuing to follow Jesus is a witness to yourself that you are saved. In 3:18-19 John, again, assures us: “ Little children, let us not love with word or with tongue, but in deed and truth. We shall know by this that we are of the truth, and shall assure our heart before Him….” Loving those Christians you associate with and those people who are not yet Christians is another witness that you are saved. I hope, if not yourself, others are encouraged by these words and might know that you can know that you are saved. Amen. I think the 2nd John chapter 3 is rich in these references about the assurance of our salvation, by John’s repeated us of “know” over and over again You are always an encouragement to read sir. May God richly bless you my friend.